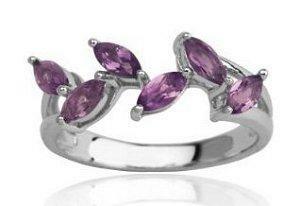 Gothic rings often show a symbolic connection to nature, such as leaf designs with precious gems. From Victorian sweetness to romantic horror, gothic engagement rings are highly symbolic choices for many couples who embrace a gothic lifestyle. While many of these rings are unique alternatives to traditional engagement rings, there are also stunning vintage styles that will appeal to many couples interested in distinctive and unusual engagement ring designs. When many people think of a "gothic" style, they picture dark, heavy makeup, black clothes, and a generally dismal attitude. The gothic style, however, is richly symbolic. Many designs for gothic rings use heavy symbolism and specialized designs to create beautiful and meaningful rings. Are Opal Wedding Rings Bad Luck? There are two basic types of gothic style rings: those that symbolize the romantic side of the gothic medieval movements, and those that symbolize the romantic horror of contemporary gothic culture. Both gothic styles are usually made from silver metals to show a starker contrast between the design and any gems or inlaid engravings, and the cooler color of a silver metal is more appropriate to gothic symbolism. Modern rings, however, may use specialized metals such as black titanium or heavier tungsten for a contemporary touch. Poison rings are distinctly goth. These symbols may stand alone or they may be part of a highly detailed and intricate ring design. Poison boxes - small rings with a hidden compartment in the setting - are particularly popular gothic ring designs that use both darker imagery as well as elaborately detailed designs. 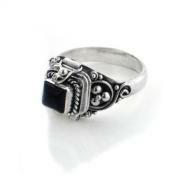 To add a romantic touch to a poison box ring, fill it with a secret love note or a lock of hair. When searching for gothic rings, it is also possible to use search terms such as biker, pagan, or Wicca rings to find similar styles with gothic elements. Engagement ring prices for gothic styles range from less than $50 to $1,000 or higher depending on the ring design, gemstones, quality, precious metals, customization, and other factors. Including fire. Fire is a highly ceremonial element for many gothic rituals, and either a fireplace or candles can add a touch of heat to this romantic question. Nighttime proposals. Most gothic culture ceremonies are sunset or nighttime events, and proposing beneath a full moon, vivid star field, or otherwise in the darker hours is the perfect way to emphasize the symbolism of the gothic ring. Privacy. Any ceremonial function that invokes gothic styles is sacred and should be kept intimate and private. Gothic rings are richly symbolic and exquisitely detailed, and they can be the perfect choice for a couple who shares a love not only of one another, but of the gothic lifestyle and culture. By choosing such a symbolic ring, the couple declares their love for one another and shows their pride in their own uniqueness.